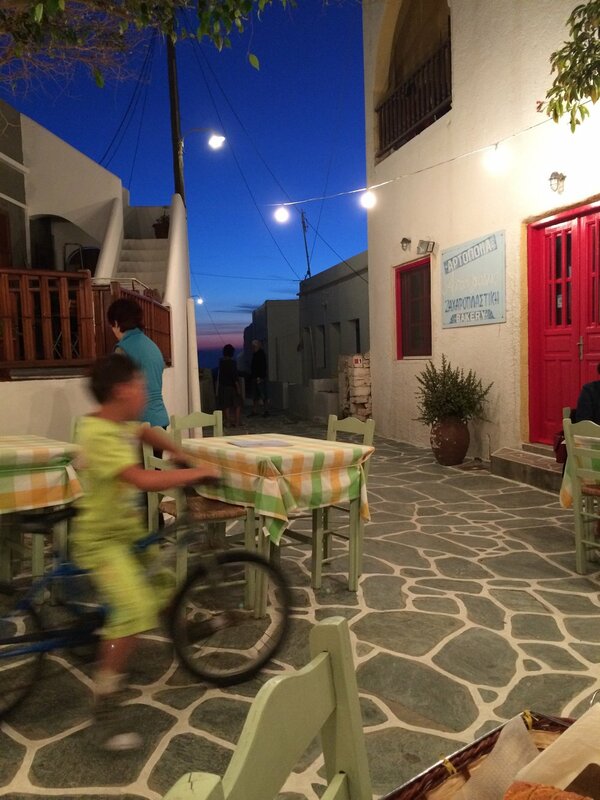 Enjoying an evening meal and local life in Chora under the night sky. Dinner included a local caper berry sauce made from capers picked fresh that day. Students are responsible for arranging their own lodging on Folegandros. Please read carefully through all the useful guidance we've provided below – you will find all you need to begin your search. There are many hotels, guesthouses, and houses to be found easily online, in all price categories. Lodging possibilities range from complete houses, to studio apartments with kitchenette, balcony and spectacular views to simple rooms with shared bath. We cannot recommend specific places to stay, or estimate your costs for you. However, you can easily book the arrangements that suit your own budget with some online research. If you’re interested in sharing lodging with other workshop participants (sharing a rental house, a hotel room or apartment, etc. ), please contact our registrar at aegeaninspiraton@gmail.com. They will compile a contact list of people interested in sharing accommodations. BE SURE that you are looking at rooms on FOLEGANDROS when searching accommodations online. Booking sites sometimes list locations on other islands when Folegandros is typed in! Make your lodging arrangements as early as possible! Accommodations on Folegandros can fill up early. We highly recommend making these arrangements at the same time that you register for the class and arrange your flights. 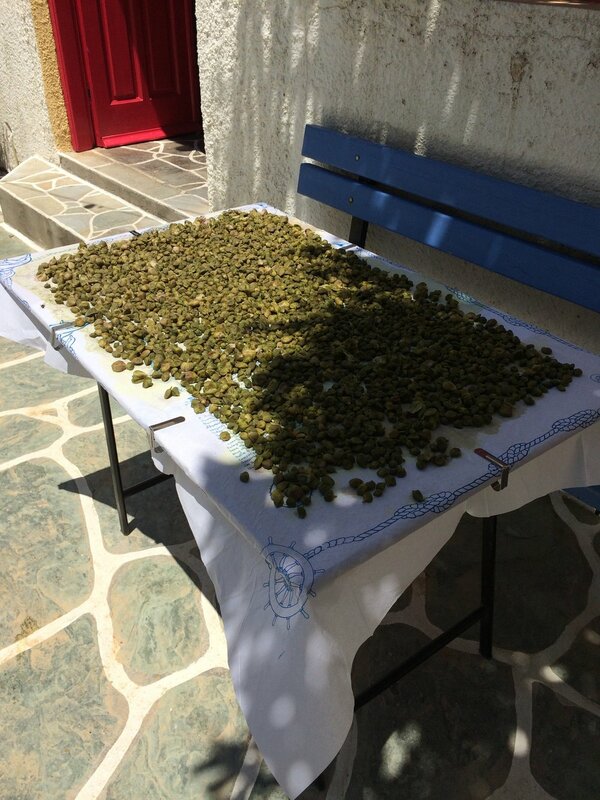 Locally picked caper berries, drying in the sun, used to make dinner in the photo above! 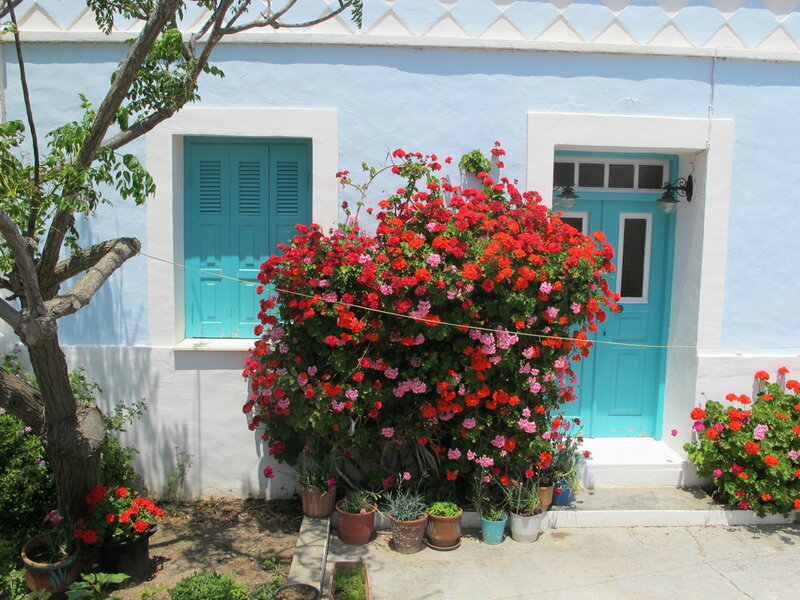 WE RECOMMEND LODGING IN CHORA, the central village on Folegandros. The workshop is held here. This is the best place to stay, so that you can easily walk to the classroom from your hotel. There are also other lovely towns on Folegandros. Because this is not yet high tourist season (a good thing for us, as the island will be less touristed), the local buses will run, but on a limited schedule. Class is held in the all-purpose room of the local high school in Chora town. Staying in Chora (or in the outskirts of Chora), you will easily be able to walk to the classroom, restaurants, and shops from your hotel. Chora, perched on a cliff-top plateau, is a small, classical Cycladic village. Renowned as one of the most beautiful towns of the Cyclades, the village has three intimate, shady town squares, many wonderful tavernas, and a Kastro section dating from the 13th century. The official town map of Chora is here. You may prefer to lodge in the PORT VILLAGE OF KARAVOSTASSIS. Here your hotel will be steps from a beach. Buses run between Chora and Karavostassis – the ride is approximately 10 minutes. However, because this is not yet “high tourist season,” the buses will not be running many times during the day. A rental car is advised. ANO MERIA is a simple country village on a country island! It is a bus or car ride from Chora (where our workshop is held). Perched high on the cliffs, it is beautiful, remote and quiet. This is a very small village, so if you want more action – choose Chora. If you really want to get away from it all outside of workshop hours, this is a lovely option. If you decide to stay in a location on Folegandros that is not in Chora town, we highly recommend renting a car. An option may be to go in together on a car with roommates if you are sharing a hotel room. We recommend this rental car company. Ask your hotel if they accept credit cards – some are on a cash-only basis. Many hotels open in May – try their contact number in Athens if you are contacting them before May. Always bring written confirmation (paper copy) of your reservation with you. If you are rooming alone – please be aware that many hoteliers will charge a supplemental fee for single occupancy. This is standard in resort areas worldwide. Ask hotels about their single occupancy policy. If you are arriving on Folegandros very early in the morning, you MUST reserve a room for the night before in order to have a room when you arrive! This is standard hotel practice. Inquire about check-in (and check-out) times. If you look online at booking sites and they are telling you that the hotel you’re interested in is full, don’t assume it is. The booking agencies often only have access to a certain number of rooms in a given hotel – the hotel saves some to rent out themselves. If you contact the hotel directly, you will often be able to find lodging in a hotel which a booking company lists as full. This being said, book your rooms as soon as possible – they do fill up quickly. If you wish to stay within easy walking distance to the workshop classroom location, inquire with prospective lodging management about walking distance/time to the Chora High School. The workshop is held there. If you know you want a sea view or terrace, contact the hotel management to inquire about specific rooms, etc. Let us know if you're looking for a roommate/another student in the workshop to share housing with! Email our registrar at aegeaninspiration@gmail.com.